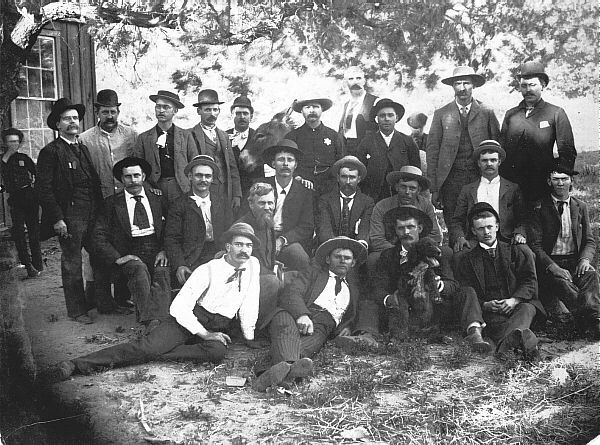 FRONT ROW (SEATED): Unknown (a relative of the Pico family), Ed Mahler (Newhall blacksmith), Dan Pardee (with dog), James Miller. SECOND ROW: Walter Scott, Charles Young, George Mendenhall, Charles Pardee, Luke Kellogg, George Townsend, Jeff McCracken, Walt Taylor. BACK ROW (STANDING): Lou Zucker (Pico machinist), Ed Peterson, Clyde Torrey, George Butler (Newhall grocer), Johnny Rico, Ed Pardee (Newhall constable), Harry Carmony, John Housal, Ed Hitchcock (Pico blacksmith). The man on the burro behind Ed Pardee is unidentified.